An article recently published in Nature Communications has suggested a connection between the Sgúrr of Eigg and a distant rocky outcrop Òigh-sgeir, with a major volcanic eruption on the island of Skye and a significant climate event 55 million years ago, the Palaeocene-Eocene Thermal Maximum (PETM). 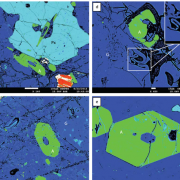 Valentine R. Troll et al compared mineralogy and isotope geochemistry of the pitchstone on Eigg and Òigh-sgeir, and the results suggest that the two outcrops represent a single, pyroclastic deposit. 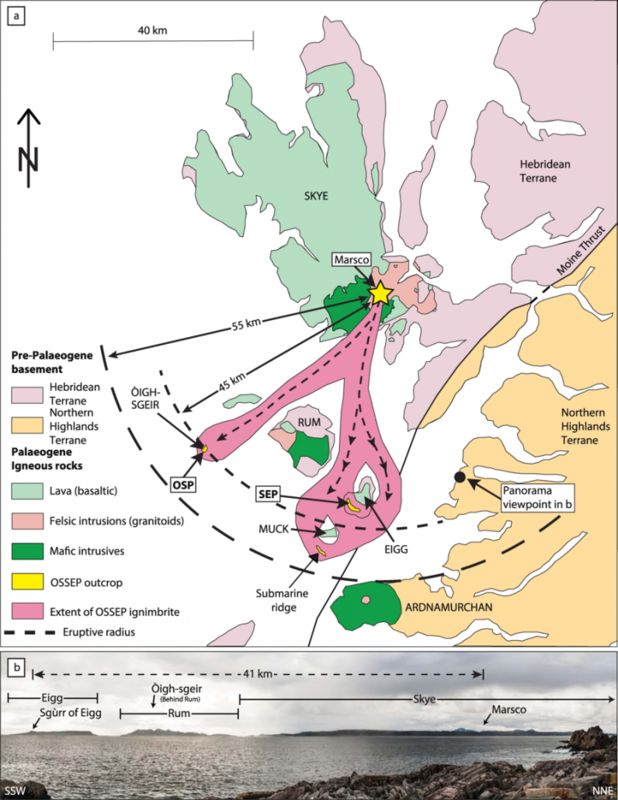 Prior to this study, David Brown and Brian Bell (in a paper published in 2013) had suggested a connection between the outcrops and an volcanic eruption on Skye – the new paper confirms these results and proposes a connection with the PETM. The magnitude of the Skye volcanic eruption was estimated to 3.9- 15 km3 DRE (dense-rock equivalent) and a 5-6 on the Volcanic Explosivity Index scale, which compares with historical examples such as the 1991 Pinatubo eruption ( ~ 5 km3 DRE). The results imply that large-scale explosive silicic eruptions have likely been common during the opening of the North Atlantic. This paints a more violent picture of the rift to drift transition of the North-Atlantic region between 61 and 56 million years ago than previously assumed. You can read more about the Sgúrr of Eigg and different ideas proposed in the past to explain its formation by some of Scotland’s well-known geologists (including Hugh Miller and Archibald Geikie) in the Geology of Eigg (2016), by John D Hudson, Angus D Miller and Ann Allwright, published by the Edinburgh Geological Society. The next lecture of the Edinburgh Geological Society’s winter series will take place on Wednesday 23 November at 7:30pm in the Hutton Lecture Theatre at the Grant Institute of Geology, King’s Buildings, Edinburgh, when Professor Brian Upton, University of Edinburgh will talk about Volcanoes and the Making of Scotland. Volcanoes have played a major role in the creation of Scotland’s geology. The most recent examples on the west coast are a mere 60 million years old, but rocks composing many of the famous Scottish landforms such as Glencoe are the direct result of earlier episodes of volcanism. 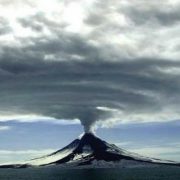 Volcanoes and the Making of Scotland will explore back in time from the most recent examples to volcanoes of the obscure Precambrian times which left their signature in the ancient rocks of the far north-west. Brian Upton is a Distinguished Fellow of the EGS and is Emeritus Professor of Petrology and Senior Honorary Professorial Fellow in the School of Geosciences of the University of Edinburgh. The comprehensively-revised second edition of his highly-acclaimed book Volcanoes and the Making of Scotland has recently been published and has been enthusiastically reviewed. The meeting will be followed by tea and biscuits in the Cockburn Museum of the Grant Institute, to which all are invited. A link to a map of the campus can be found at http://www.edinburghgeolsoc.org/l_home.html .